Being a steward along this multi-state trail can mean many things, from participating in a clean-up of a local historic park or stream, to creating audio or video tours of your neighborhood’s Star-Spangled history for others to use to explore long-ago events. School groups have an especially important role to play in this effort. School projects in which students research, retell, and interpret the historical events in their community are at the heart of the Trail Stewards Network. For more information, check out the associated National Park Service resource guide. 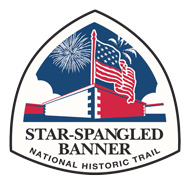 Earn your Star-Spangled Banner Trail Junior Ranger badge! Test your flag smarts and singing skills! Visit the National Museum of American History’s Star-Spangled Banner website. Cast your vote for or against declaring war on Great Britain in Fort McHenry’s interactive game! Experience life aboard “Old Ironsides”, the USS Constitution, in an interactive game, available online and for iPad.